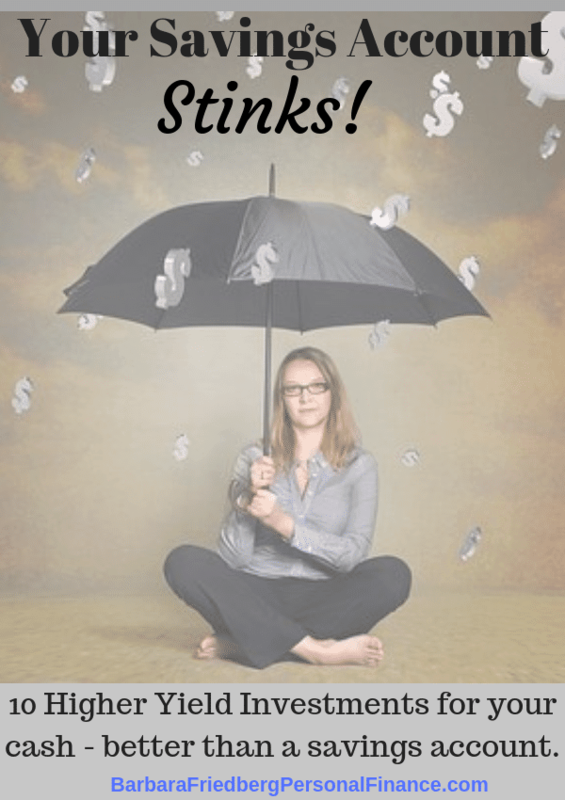 Despite recent Fed rate hikes, savings account returns stink! With many banks offering an APY rate of 0.05% or less, using a bank savings account as a long-term investment option is not your best money move. You won’t be growing rich by watching your account grow in pennies. Bonus; Should I Pay off My Mortgage or Invest in the Stock Market? Don’t fool yourself into thinking that you are keeping your money safe in these risk-free savings accounts either. Stashing your money in a low-interest savings account means you’re just robbing yourself of potential earnings as inflation eats into your buying power. Right now, you’ve got time on your side. Maybe you have 10 plus years to let your savings grow but sticking with a crappy savings account wastes the benefits that time can have on your money’s growth. Even if you need your money sooner, there are many savings account alternatives that beat the low bank interest rate. A few minutes of research and planning can yield superb returns on your savings, whether you need the money next month, next year or five years from now. Make your money work smarter for you by placing it in one of these ten savings return alternatives instead. Just be aware that these other investments might increase your returns, a few might be a bit riskier and your investment returns could go up and down, unlike a savings account. Look, I am not a complete hater of savings accounts. They are necessary when you need a place to stash your emergency fund or short-term saving goals. Still, there are better places to stash your cash than at a brick and mortar bank. Online savings accounts typically offer a significantly higher APY than their traditional banking competitors. For instance, an online bank with a rate of 1.45% APY on their savings accounts offers almost 50x more in interest than traditional banks who offer just 0.03% on a similar account. That’s a huge difference! Online accounts are also beneficial for specific savings goals and emergency funds. Because the money is held separately from your general funds and accounts, you are less likely to dip into the money for unnecessary purchases. Once you build up your savings, it’s once again time to look for better investment opportunities for majority of your money. Doing so will help make your money work harder for you and give you the chance to build real long-term wealth. Don’t confuse these with bank “money market savings accounts.” These are investments that only buy highly liquid cash and cash-equivalent securities like short-term government and commercial bonds. The fixed income investments owned by these funds have typical maturities of less than three months. So, as interest rates rise, so will your returns. The Vanguard Prime Money Market Fund, Fidelity Money Market Fund and Schwab’s Value Advantage Money funds currently yield between 1.75 and 1.94 percent. Although the funds aren’t FDIC-insured like a certificate of deposit, the fund issuers strive to keep the principal value at $1.00 and they’re also backed by the Securities Investor Protection Corporation (SIPC) that covers up to $500,000 in securities should an investment brokerage firm go bankrupt. Also issued by banks, certificates of deposit pay higher interest rates than your savings account. They’re issued for various terms from a year on up to 5 years or more. Typically, the longer maturity CDs pay higher interest rates. That’s because you, the investor, demands a greater return for tying up your money for a longer period of time. Online banks are great places to buy certificate of deposit because they usually pay higher interest rates. That’s because they don’t have the bricks and mortar overhead that a stand alone bank has. CDs pay higher interest rates than your bank savings account because you’re tying up your money for a longer period of time and the bank can lend out your dollars to others without the risk that you’re going to withdraw the funds tomorrow. Although, if you choose to withdraw your money early from a CD, you might face a small 3 or 6 month interest penalty. Our experience is that, even if you think you might need your CD money early, the penalty is usually worth the higher return that you get on your cash! 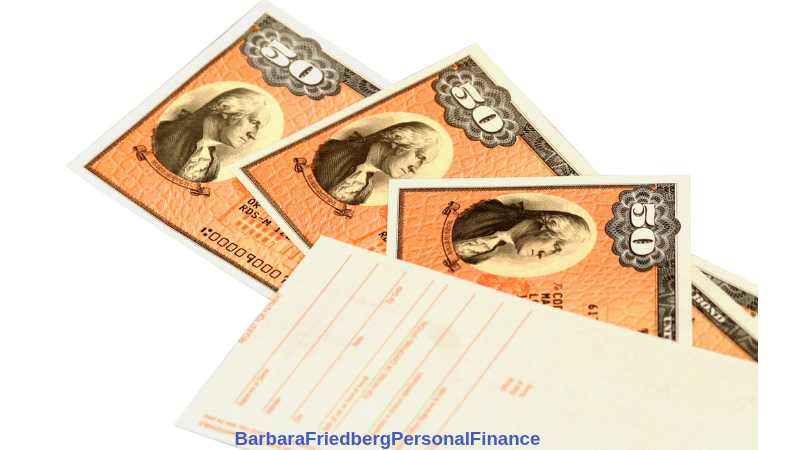 The U.S. government offers two types of investments that protect your cash from inflation! The first type is an Inflation bond or I bond. It isn’t well known, because your investment advisor doesn’t get a commission if she sells you one. The I Bond’s return keeps up with the rate of inflation. You can buy them at TreasuryDirect.gov. The first interest rate is set at issue. The second interest rate changes every six months, based upon the inflation rate. Your return is the combined interest rate of the two. Your interest is added on to the value of the bond and you get the entire amount when you redeem it. I bonds earn interest for 30 years, but can’t be redeemed before one year. If you cash the bond in between one and five years, you lose 3 months of interest. Yet, if you think the U.S. government is going to be around for awhile, then these are extremely safe investments and great savings account alternatives. These sister securities to the I Bond are also bought at TreasuryDirect.gov. And, these bonds returns keep up with the rate of inflation as well. But their interest is paid differently than the I Bond’s. A TIPS bond is issued with a set interest rate. But, the principal amount goes up as inflation rises (or drops) and the interest is paid on the new, higher principal amount. Interest is paid twice per year. The bonds can be bought for $100 or more (in multiples of $100). TIPS are issued in terms of 5, 10 and 30 years. When you cash in your TIPS bond, you get the adjusted principal value and all of the accrued interest payments. If you’d rather not buy individual TIPS bonds, there are many TIPS and inflation protected securities funds including the Vanguard Inflation-Protected Securities Fund (VIPSX). This fund has a low 0.20% expense ratio. Another benefit of both TIPS and I Bonds is that their interest payments are free from state and local taxes. If you’ve never heard of short-term government floating rate debt, you’re forgiven. They were first issued by the U.S. government in 2014 and pay a variable interest rate, based on 90-day Treasury bill’s returns plus a spread (or premium). When interest rates surge, so will the payments of these investments. And, like all U.S. government securities FRNs are free of default-risk. The U.S. government is not going bankrupt so your money is quite safe. Although floating rate means that the principal value of your investment is not guaranteed and could go up or down – a smidge. Instead of buying the floating rate debt directly from the government, consider the WisdomTree Floating RAte Treasury ETF (USFR). The fund tracks the price and yield performance of the Bloomberg U.S. Treasury Floating Rate Bond Index. Since the underlying debt is extremely short term, the risk to your principal is minimal. Short term bond funds include ETFS and mutual funds that contain debt securities with maturities less than five years. The benefit of owning these types of investments is that you’ll goose your returns a bit. The drawback is that when interest rates rise, as they have during the last year or so, you might lose a small amount of value. That’s because bond values drop and interest rates go up. But the advantage of shorter term bond funds is that they’ll fall less in value than longer term bond funds. These funds come in many varieties from government to corporate funds. The iShares 0-5 Year Investment Grade Corporate Bond ETF (SLQD) owns bonds with maturities between zero and five years. The fund tracks the investment results of the Markit iBoxx USD Liquid Investment Grade 0-5 Index composed of U.S. dollar-denominated, investment-grade corporate bonds with maturities less than five years. With a 2.56% yield and an enviable 0.07 percent expense ratio, there’s a lot to like here. If interest rates continue rising, the maturing bonds will be replaced with higher yielding short-term bonds. Many people think robo-advisors are only for long-term investing. But these digital investment platforms are also great places for your cash. Betterment, one of the first robo-advisors, just launched the Betterment Smart Saver option, currently yielding 2.23%. This feature allows Betterment customers to put their cash to work in conjunction with their Smart Saver low-risk investing account. While M1 Finance is launching a suite of cash management tools such as a debit card, direct deposit and M1 Spend Checking. One of the investments I made (outside of my retirement account, that is) was to buy a rental property. Becoming a landlord is an excellent way to create residual income because people will always need a place to live. Even if I decide down the road that being a landlord is no longer right for me, I can sell my property and reclaim most, if not all, of my costs. Better yet, as home values increase, I could (and should) turn a profit. I hear you. There are several inconveniences that come with wearing the landlord hat. However, these temporary issues seem so minor when compared with the benefits. You wouldn’t start a new job without expecting some pain points, right? The same principle applies with real estate investing. It’s not a hands-off job, but your money has the chance to grow faster than in a traditional savings account. If you’re interested in real estate investing, but don’t like the hands-on part, then consider buying a real estate investment trust (REIT) fund. You get the benefit investing in real estate, with steady income, without the headaches. Popular REIT funds include: Vanguard Real Estate ETF (VNQ) for U.S. real estate exposure and SPDR Dow Jones International Real Estate ETF (RWX). Do you love the idea of investing in real estate but hate the idea of managing your properties? Crowdsourced real estate companies like Fundrise and RealtyShares allow you to invest in real estate properties minus the headaches of being a landlord. These are a different take on real estate investing than both REITs and actual property ownership. Instead of investing in the typical public stocks and bonds, you can diversify your portfolio by investing in private market real estate. That means the money you invest will be used to purchase individual properties. Fundrise is a great option for the average investor. With just a $500 minimum investment, you can invest in Fundrise’s starter portfolio package. If you aren’t satisfied with the performance or the company after 90 days, you can receive your money back. If you do love the company, you can upgrade to an advanced plan for free once you invest $1,000. RealtyShares is another great option, but it’s a little harder to get started. Here, the minimum investment is $5,000. You’ll also need to be an “accredited investor” to qualify. Still, with over $700 million already invested, it’s something worth checking out. These platforms offer a more personalized way to get into the real estate market than buying a REIT. And yet, these crowd sourced real estate platforms aren’t as much work as the DIY landlord route. Should I Give Up on Savings Accounts Altogether? Like I alluded to earlier, savings accounts aren’t horrible, and they can be useful for building an emergency fund. In fact, I applaud you for making the decision to save any money at all. If you need a way to save money for short or intermediate term goals, your well-advised to choose a savings account alternative. Increasing your returns by a percent or more means more money for you! However, to build real wealth, you need to find ways to make your money work for you. Don’t keep all of your money in one place, and look for ways to earn more interest on the money you already have. Doing so can be the key to a wealthy and financial healthy future. For long-term savings goals, the stock market a sound way to grow wealth for your future. But, since it’s more volatile than these savings account alternatives, only invest money that you won’t need for more than five years or so in the financial markets. Greg Johnson is a personal finance and frugal travel expert who leveraged his online business to quit his 9-5 job, spend more time with his family, and travel the world. He is the co-owner of the popular blog Club Thrifty, where he teaches others how to spend less and travel more. The post Your Savings Account Stinks. Here are 10 Places to Keep Your Money Instead appeared first on Barbara Friedberg.